Funded by the U.S. Embassy-Beijing, this program featured three separate tours with distinguished Native American artists conducting workshops and performances across China. The program visited Kunming and Beijing (March 2014), six cities across Inner Mongolia (April 2015), and several cities in northern Heilongjiang Province (May 2016). Visit the program’s Flickr album to view photos from these exchanges. Wayne Silas, Jr. leaps while performing the fancy dance for students at Chifeng Mongolian Middle and High School in Chifeng, Inner Mongolia. Photo by Stephen Manuszak. Indigenous arts provide a distinctive glimpse into the multilayered heritage of a country. Within the framework of cultural exchange, audiences and artists are able to explore a shared humanity through similar themes and traditions that often arise between cultures. This exchange provided a platform to explore values and commonalities through traditional artistry in both the United States and China. Through two-week performance tours, the program reached diverse Chinese publics including rural citizens, relocated or migrant workers, and ethnic minorities in China. The tours featured activities in a variety of settings, from rural village schools to centers for migrant workers to universities and major cultural institutions. The activities during each tour featured song, dance, storytelling, demonstrations of traditional crafts, audience participation, and question & answer sessions. Many of the workshops included Chinese ethnic minority artists and students, which encouraged interactive performances and a true exchange of traditional cultures. Arts Midwest established a network of partners in China to produce and manage these events. Each exchange featured small ensembles led by Kevin Locke, the preeminent player of the indigenous Northern Plains flute and an inspiring hoop dancer, traditional storyteller, and cultural ambassador. Kevin’s work has earned wide acclaim and reflects his roots in South Dakota and the Lakota and Anishinaabe native tribes. The accompanying artists were exemplary performers from other Native tribes, demonstrating a breadth of traditions and cultures. 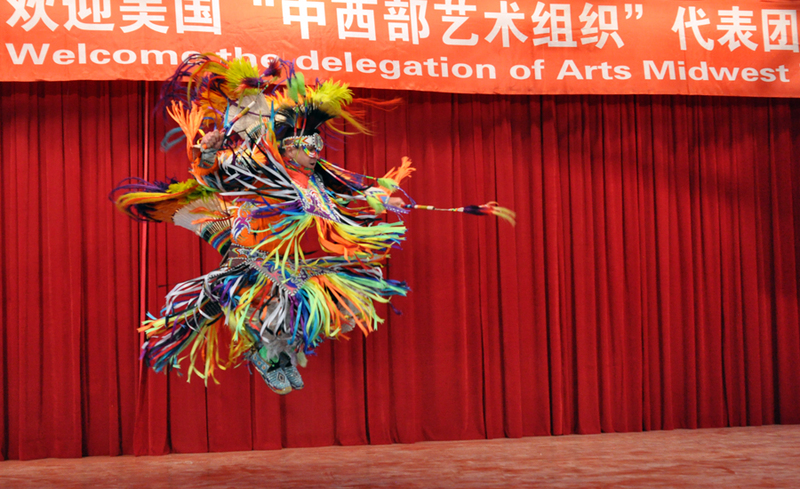 The Native American / China Exchange was a program of Arts Midwest supported by the United States Embassy-Beijing. For more information, contact Stephen Manuszak.